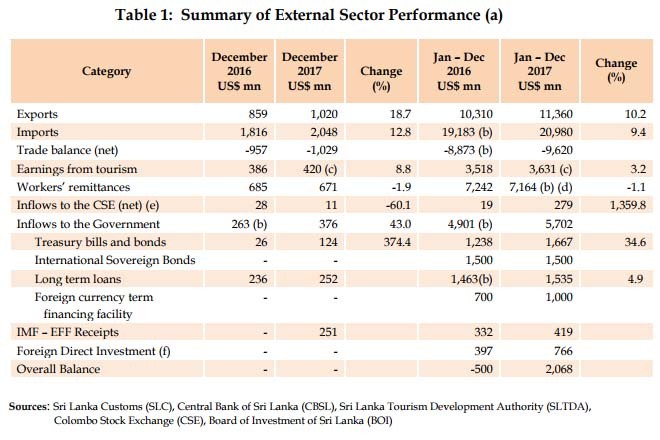 Feb 23, 2018 (LBO) – Sri Lanka’s external sector performance continued to improve in the month of December 2017, mainly with higher inflows to the Financial Account of the Balance of Payments (BOP), the Central Bank said in its latest report. . Although earnings from exports increased at a higher rate, the increase in import expenditure resulted in widening the trade deficit in December 2017. Continued inflows by way of tourist earnings and workers’ remittances, however, have contributed in curtailing the expanded trade deficit to a certain extent. Improvement in short-term and long-term capital inflows continued during the month. Reflecting the favourable developments in the external sector, the BOP recorded a surplus of US dollars 2,068 million in 2017, while gross official reserves of the country stood at US dollars 8.0 billion as at end 2017. Meanwhile, the Sri Lankan rupee depreciated by 2.0 per cent during 2017. The deficit in the trade account expanded in December 2017 exceeding the US dollar 1 billion mark for the first time since November 2012. Cumulative trade deficit also increased during 2017 reflecting higher import expenditure caused by weather related factors, offsetting the notable increase in export earnings. Earnings from tourism and workers’ remittances were the main inflows to the external current account followed by the proceeds of merchandise exports. Accounting for 51.2 per cent of total tourist arrivals for 2017, India, China, the UK, Germany and France continued to be the top five sources of tourist arrivals. For 2017, earnings from tourism are provisionally estimated to be an increase of 3.2 per cent to US dollars 3,631 million. Workers’ remittances declined by 1.9 per cent to US dollars 671 million in December 2017. On a cumulative basis, inflows on account of workers’ remittances declined by 1.1 per cent year-on-year to US dollars 7,164 million2 in 2017 reflecting the geo-political uncertainties and the continuation of subdued economic performance in the major remittance generating destinations.